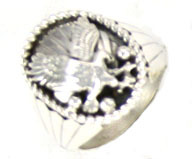 Sterling silver cast eagle with a twist wire border and fans on the sides over a handmade half round shank. Top measures approximately 1" long x 3/4" wide. Navajo crafted. Available in size 9 thru 13. Choose sizes when ordering.